You are invited to join us on Friday, January 18th from 6-8pm for the grand opening of the Moody Blues Gallery Show…. 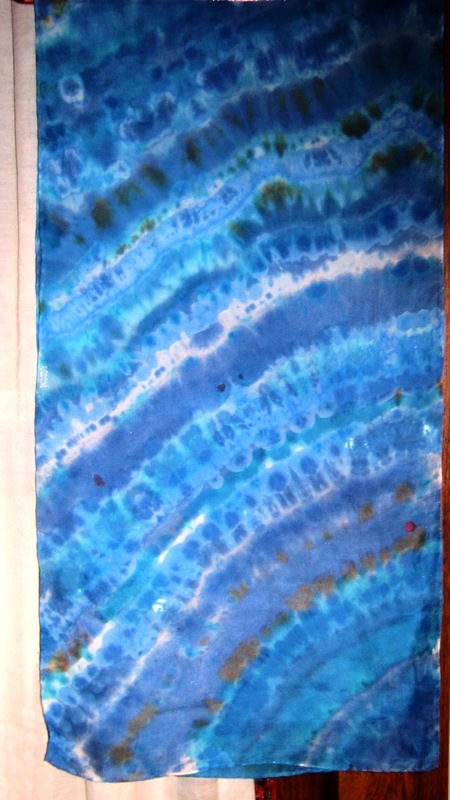 I am so thrilled that one of my hand dyed Shibori Silk Scarves was juried into the show. It is such an honor to be in the company of so many amazing and seasoned artists for this event. If you come, wear something Blue, and have a grand time with us. Hope to see you there!!!!! Kumo Shibori is a specific technique of binding fabric to create specific patterns when dye is applied. The binding is to act like a resist, not allowing dye to flow into those areas. One interesting fact about silk is that a small drop of dye will run wild on the surface of silk, spreading out as far as it can unless restrained. There are several methods for controlling this process – applying what is known as gutta (a rubberized paste) to the silk ,allowing it to dry and then applying dye. As the dye approaches the gutta line it stops. Silk dyed in this manner looks like coloring book pictures… or stained glass. Shibori instead uses the actual binding, knotting, stitching and clamping to control the flow of dye. 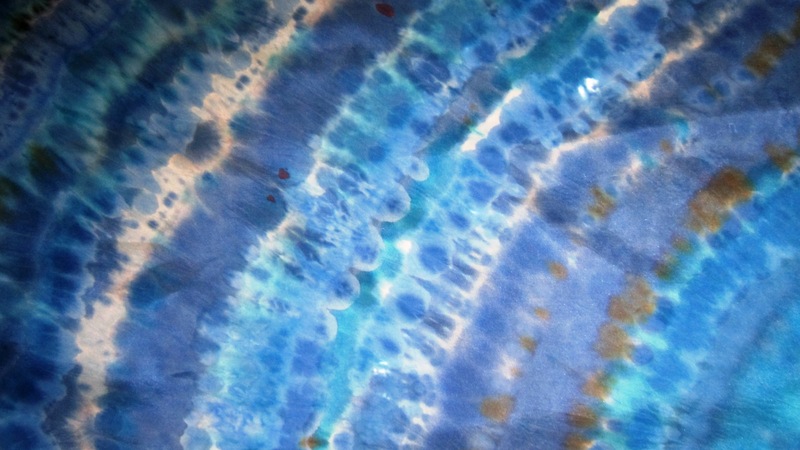 Shibori is the general name of the group of techniques. This is one example of kumo Shibori, bound and tied fabric awaiting dye. A piece of fabric dyed in Kumo Shibori… each burst of floral form was once a cone, tightly bound. In this case they used a blue and a dark midnight blue/charcoal black dye to create the forms. You will notice circular lighter lines in the pattern… this was where the string or yarn held the cones tightly. Of my work, the scarf that was juried in turns out to be one of the most traditional of Japanese Kumo Shibori patterns, known as “The Storm”. Japan is oriented to the sea, and nature is often reflected in the forms of art they practice. Coastal japan is known to experience angry and fierce waves and turbulent seas. This scarf is carefully knotted and bound before blue dye is applied. (Traditionally vat dyed indigo on cotton, however in my world it is habotai silk and tinfix or jacquard green label dye). Shades of blue emerge with ripples of white. It is difficult to duplicate the pattern precisely, but like the waves of an angry sea, each time i dye a scarf in “the storm” there are interesting variations. Tradition also dictates that the pattern is not vertical and horizontal, but has a diagonal sensibility… adding to the rippling water theme. Angry Waves, a storm… it all fits the theme of Moody Blues… Hope you can plan to attend. So you do Shibori??? Arishi Shibori?